"Let's head to the next good spot - the river is pretty slow here." Sound familiar? For years I passed right through the long slow sections of the river on my way to the next set of rapids. I was sure you had to fish in rocky, fast water to catch smallmouth bass. As you can guess, my fishing consisted of casting below rapids, walking to the next set of rapids, fishing a little, and then more walking. Quite often, there was more walking than fishing. I caught fish but in the back of my mind I always wondered about the long, slow areas in between. Some of them stretched on for miles. Could they be totally devoid of fish? When I did occasionally catch a fish from a slow moving area, it surprised me. As you walk your way through slow water sections you will start to realize there are very few areas where the bottom is all the same depth or consistency. The reason for this is current. If you haven't seen the river in high water flood conditions or when the ice is breaking up you can't really appreciate the forces involved here. 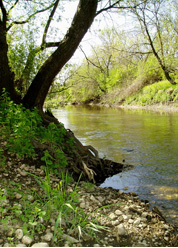 That slow water area can become torrent in high water, excavating all kinds of changes in the river bottom that smallmouth bass use for resting, feeding, and traveling. Some things to feel for with your feet include changes in bottom content (such as muck to hard clay, sand to gravel or rock, or slab bedrock to broken rubble), changes in depth, and submerged rocks or trees. Often while walking through a slow section I would trip over a submerged rock or log. More than once I would step into a deep hole and quite literally fall into good fishing. This is called learning to read the water the hard way. Some of the most productive spots that are very hard to find except with your feet are those with ledges or shelves. These are dangerous to step off of and the wading staff might help you here. It doesn't need to be an expensive one; mine consists of a broomstick on a short piece of string attached to my belt. The smallmouth bass will travel along these edges as they feed and move upend down the river. Changes in depth and bottom content provide protection from the current and shelter for the food that these fish seek. Another situation where you can use your feet to find the fish is when you get a fish out of an area and you don't know why after you've covered the area thoroughly. Go ahead and wade right in and see if you can figure out that way why he was there. Obviously you need to use caution here as with all river wading. Besides using your feet to find fish in slow water, you can also use your head, especially your eyes. Start with obvious places. Anything different can provide habitat for Mr. Smallmouth. Bridges, rip rap, tree roots, fallen trees, any place water enters the river, and even old appliances are worth checking out. In the high, fast water of spring the river will dig deeper holes around anything that deflects the current. Less obvious things to look for with your eyes include boils or slight ripples on the water's surface. Boils on the surface occur due to something on the bottom deflecting the current up towards the surface. The object causing the boil is not directly below it; the faster and deeper the water, the further upstream the object causing the boil will be. Casting upstream until your lure makes contact with that object is the best way to fish and understand these areas. When you finally do locate what is causing the boil, take the time to fan cast around it, as fish will position themselves almost anywhere surrounding an underwater structure. Late summer or fall is a great time to use your eyes to find normally hidden structures. With the water low and warm you can walk easily, see exposed rock at the waterline, and with the clear water of fall many submerged ledges, big rocks, and other underwater features are now visible. Some of my favorite slow areas are hidden rocky lifts that don't break the surface. The bottom comes up, gets rocky, and drops down again. Only in the lowest of water conditions will a telltale boil appear, giving hint of the good fishing below. Remember to take notes. One last benefit of fall fishing is the presence of leaves on theater. I used to dread fishing this time of year because of leaves fouling my lures, but now I look forward to it. I have learned that drifting leaves will indicate current even in those areas where my eyes may tell me theater is still. They can be one of the greatest teachers of reading theater. Just put on a heavy, wheedles jig to punch through the leaves on the surface. All of a sudden eddies, current cuts, and main channel areas are easily recognized. Many times, especially in slow water sections, there will be wood everywhere in the water, and this can be overwhelming. Where do you start? Being able to see the changes in the current is essential to knowing whereto concentrate your fishing time when "too much of a good thing" syndrome strikes. Leaves will indicate where the main channel lies. The fish may note right in the main channel, but they won't be far from it either. My rule of thumb is to focus on the wood near the deepest and fastest water I can find. I would apply this also to any similar situation, such as too many rocks, weeds, or reeds. If you miss out on fall leaf fishing, try scouting the river just before it freezes solid. I haven't caught many fish at this time but the scenery is beautiful and the last part to freeze on a river is usually the main channel where the river is deepest and the current is fastest. Observe to see where the main channel nears the bank. These areas hold the potential for the deeper water, ledges, and bottom content changes that are so important in smallmouth bass fishing. Take note of these areas and you can focus on them next summer. All this talk about isolated fish can really get you going. But don't just run out and start fishing. Besides using your feet and eyes, using your lure to feel bottom changes is yet another way to read the river and locate fish. My primary lures for this are jigs and crankbaits. They have to be heavy enough and swim deep enough to constantly hit bottom. This may mean adjusting the size and weight of your lures and speed of your retrieve, depending on how the river changes. Your goal should be to be able to tell the depth and bottom content by how your lure feels and how long it takes to sink. One way to practice this is to cast out and try to determine the structure of the bottom with your lure, then walk out and check it with your feet. Being able to interpret the river bottom structure with your lures will add a whole new dimension to your fishing. Not only will you be learning the bottom of the river, but also it will put your lure in contact with more fish. It takes real discipline to cast to seemingly featureless water when you know there is a nice riffle a hundred yards away. Fan casting - placing your casts three or four feet apart as you move up or down the river, covering one hundred percent of the water - is a great way to learn theses low areas. Don't attempt to fan cast a one-mile section; starting with smaller pools that are quickly covered will build your confidence. Once you've experienced some success and become more proficient at reading slow water, you can bite off bigger chunks. A good fishing partner can help speed things along and allow you to try two different lures at once. Besides jigs and crankbaits in slow water, try some top water lures, especially buzz baits. It only takes a few casts to see if the fish are interested, and if they are it can be a great way to cover a lot of water quickly. Be sure to throw a jig around any wood or rock that gives up a fish on a top water lure, as a few of his more timid friends may be lurking below. I personally like to focus on these deeper, slower areas when the waters warm and clear. This usually ensures that the fish are fairly active and willing to travel to catch my lures, so my presentation doesn't to have tube right on. The next time you're out and the urge strikes you to push on to the next "good" spot, take a few moments to scout out that slow moving pool before moving on. Cover the water thoroughly, remember to use your feet, eyes, and lures, and you'll be into great fishing where you least expected it.